Roka Akor is known for sushi, but don’t let that dissuade you. 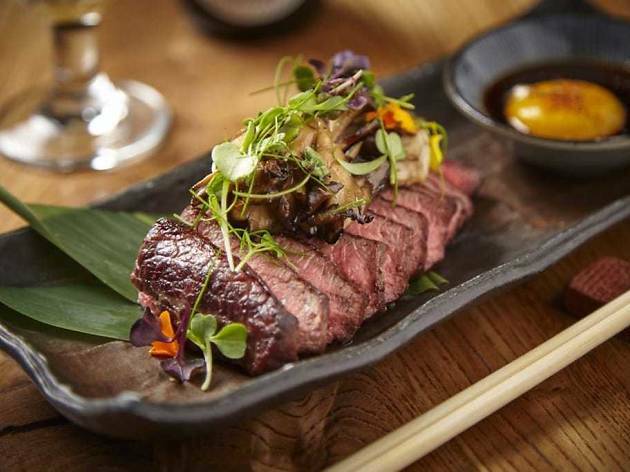 Roka’s A4 and A5 Japanese wagyu beef will make you forswear seafood entirely. The Asian-inspired decor is stylish, but and warm, from the slab wood tables to the moody lighting. The centerpiece is the robata grill in the center of the restaurant, where chef Roman Petry prepares Asian-inspired, decadently dressed cuts of beef. Try the 6-ounce wagyu sirloin, served with grilled bone marrow and spicy sweet garlic soy, or the wagyu flat-iron steak, complemented by maitake mushrooms and a runny egg yolk. The house wafu dressing, a savory soy vinaigrette, pairs well with any of the cuts, as does the decadent black truffle-infused aioli. 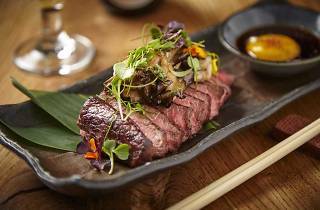 The menu spans various bone-in and dry-aged cuts, as well, sourced both domestically and from Australia and Japan.